"Land of Mountain, Moor and Loch", and "Land of Mountain and Flood" are phrases which have long been used to describe Scotland and these descriptions are no more appropriate than when applied to the lands to the North and West of Inverness. Not only is the scenery among the most beautiful anywhere, it is also extremely rugged and desolate and supports a very low population base. If it is surprising that a railway was built at all in such difficult and inhospitable circumstances, that it has survived into the 21st century, despite being under constant threat of closure is truly remarkable. In the face of these difficulties a number of schemes for an extensive rail network in the area were formed in the middle part of the 19th century, and it has to be said that several of these were borne of misplaced optimism rather than commercial reality. It appears extremely unlikely that the shareholders would have provided the necessary financial backing for such proposals. Railway interest in the Northern Highlands therefore fell into three categories: those lines which were built and are still open, those lines which were built but which have since closed and those lines which did not get past the planning stage. 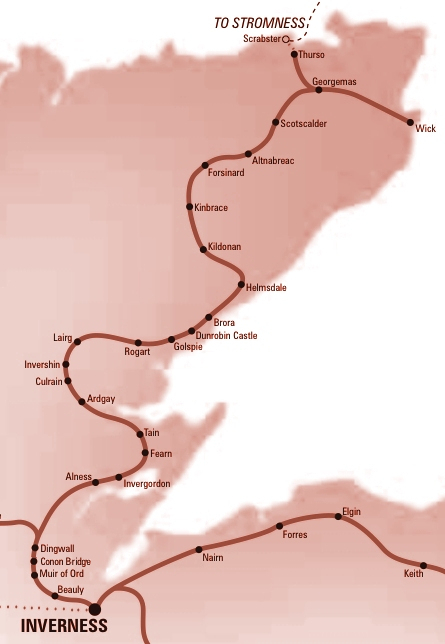 The backbone of the Highland Railway system north of Inverness consisted of a line to Dingwall (18 miles) which then divided to reach Kyle of Lochalsh in the west (eventually) and Thurso/Wick in the north. Branches were constructed from Muir of Ord to Fortrose (opened 1894, closed to passengers 1951 and freight 1960), from The Mound to Dornoch (opened 1902, closed 1960) and from Wick to Lybster (opened 1903, closed 1944). West of Dingwall a short branch served Strathpeffer, a Victorian spa resort and while this enjoyed patronage in the early part of the century, it closed to passengers in 1946 and completely in 1951. Space permits only a brief allusion to those lines which progressed no further than the planning stage. These were, on the Kyle line, an extension to Skye via a bridge, and branches from Achnasheen to Gairloch and Aultbea, and Garve to Ullapool. On the Far North Line branches were proposed from Bonar Bridge to Lochinver, Lairg to Laxford Bridge, Forsinard to Melvich, Thurso to Scrabster, Thurso to John o'Groats and Fearn to Portmahomack. In addition a branch from Conon to Cromarty was started with 6 miles of track and earthworks being laid down at the Cromarty end, but the outbreak of war in 1914 led to the abandonment of the project. Most of the proposals would have served areas with a very low population density and it is probable that freight, mainly in the form of fish and timber, would have accounted for much of the traffic on the lines. Even so, it is difficult to see how they could have succeeded, even before the advent of road traffic. A glance at the map of the North of Scotland will reveal why the length of The Far North Line is approximately double that of the straight line distance. The topography is complex: there are three firths (Beauly, Cromarty and Dornoch) and other features such as the high ground to the north of Helmsdale known as the Ord of Caithness. For this reason the railway followed the much easier route through the beautiful Strath of Kildonan, leaving the fishing villages between Helmsdale and Wick isolated. This is a map of the Far North Line which is situated in the northernmost part of Scotland. Hovering the pointer over the name of a station will display a local photo. The line was built in stages from 1862 and finally opened all the way from Inverness to Wick in 1874. Forty-five stations were constructed along the route and of these only three were closed before the general rationalisation of 1960. The closures were based on a mileage-between-station basis rather than on likely passenger use and some sizable communities lost their station, such as Beauly, Conon Bridge and Evanton whilst at other smaller settlements the station was retained. In 1976 and 1983, respectively, the stations in Muir of Ord and Alness were reopened and 2002 saw the reopening of Beauly station. Conon Bridge station was reopened in 2013. The Far North Line is now a basic railway. The only staffed stations are Wick, Thurso and Dingwall, Brora losing its staffing in 1992. The line is signalled on the Radio Electronic Token Block System (RETB) controlled from Inverness. The consequent reduction in staff has been the most influential factor in the line's continued existence. At present, there are four trains each way per day plus a much improved Invernet service and an all year Sunday service of two trains in summer and one in winter. Improvements to connections to the South and East have been made. It is hoped that the Friends of The Far North Line will be able to press for more improvements to these services while at the same time ensuring the continued retention of the line by lobbying for the return of freight.